People often like the idea of having cameras that are out in the open. It can be a deterrent to criminal activity and be a signal that you are watching your business or residence. There are times when you are suspecting someone of a crime, or you may need to keep an eye on things without drawing attention to yourself. KT&C offers a couple of different covert housings with cameras built-in. Both cameras are HD-TVI and offer a resolution of 1080p. One camera is in a smoke detector housing and the other is in a PIR housing, both are non-functioning units. These housings are very common in both homes and businesses and therefore easily blend in with the decor. You may be in a situation where you need a custom housing with a covert camera inside. One of the products KT&C known for is their lineup of miniature cameras. KT&C offers IP, TVI, SDI and Analog miniature options. Many of these miniatures offer lenses that are changeable or are available with a pinhole option. Currently, the smallest option is a model that is under an inch (23x23mm), but sizes can vary slightly with many being in the 1.18 inch (30x30mm) range. With so many miniature options you can put a camera inside almost anything to match the environment and the decor, without raising suspicion. You can easily hide a camera behind a ceiling tile, within a teddy bear or even hide one within a picture frame. If you have questions on miniatures or anything else, please let us know how we can help. Simply enter your info here and we will get back to you right away. TVI DUAL OUTPUTS: ARE YOU TAKING ADVANTAGE OF THIS FEATURE? HD-TVI cameras support two kinds of analog signals, Standard Definition, and HD-TVI. 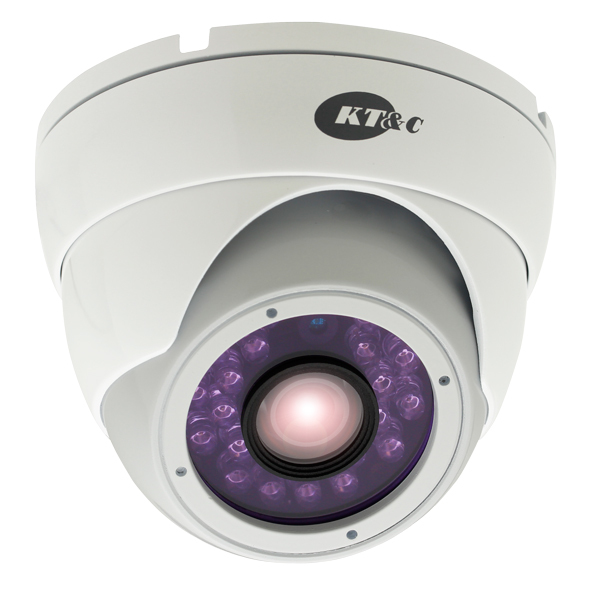 Some KT&C cameras offer dual outputs on the camera that allow you to utilize both signals simultaneously. Dual outputs give you the ability to loop your camera to a dedicated spot monitor with ease. A practical example of looping your camera might be an application for a doorman or lift gate operator. With dual outputs, one wire run would go directly to a recorder and the other to a dedicated spot monitor. Having the camera set up to a dedicated spot monitor can have a lot of advantages, especially if you do not want the doorman to have any control over the camera or recorder. It eliminates the need to set the doorman up as a user on the recorder and can be helpful in areas where a locations network is not strong. The other advantage is that in this scenario, the camera is likely already close to the location of the doorman. Now you can set up this spot monitor directly from the camera with ease. As discussed earlier in the week, we are well aware how smartphones are used for every aspect of life. We believe Guarding Expert, our mobile app for iOS is a great tool you can use to access your DVR & NVR on the go. The PDF at the end of this post will continue with the instructions on using the Guarding Expert App. As a company, we are here to help and assist you. Our website www.ktncusa.com offers many additional documents for product setup, along with free training videos on networking your DVR/NVR. We encourage you to learn more about the features and function of your KT&C products so you can take full advantage of everything they offer. It should be no surprise to anyone that more and more people are using their smartphones for every aspect of life. KT&C knows that our customers want to be able to have access to view their security & surveillance footage while on the go. Guarding Expert (iOS) from KT&C is mobile client software used with products that are compatible through the iPhone (iOS Version 6.0 or higher). Guarding Expert is used to remotely monitor live video from embedded DVRs, NVRs, and network cameras. It also can play back recorded files, locally store and manage pictures and videos, manage alarm notification and information and also utilize PTZ controls. This app gives you the opportunity to control many aspects of your security system from your iPhone or iPad. Part 1 of this post we will be covering some of the basics of the Guarding Expert Mobile App. Included is an explanation of the menu items and icons for the live and playback views. Part 2 will cover some additional information such as adding additional devices. You can look for part 2 a little later this week. New 19/22/27″ Monitors Now In-Stock & Shipping! KT&C is glad to announce the arrival of their new LED monitor lineup. There are 3 high definition wide-screen models, 19/22/27″, that are currently available. Arriving soon will be a 19″ 4:3 ratio version. These monitors have been designed for the security industry. In addition to having HDMI/VGA/BNC inputs, there is also a looping BNC output. The 19″ version offers 1280x720p resolution through the HDMI input while the 22/27″ version offers high definition 1920×1080 resolution. The flexible On Screen Display boasts 7 different languages. For flexible mounting, all monitors offer easily removable stands with a 100mm VESA mounting option. For pricing, please contact one of our distributors. For additional info, please visit our website. Are You Using Outdoor Cameras Inside? A recurring trend seems to be to use outdoor cameras inside. I have seen multiple security installations, where the cameras installed look cheap and ill-fitted for the luxury design of the room. The biggest problem I see with this is that outdoor cameras tend to be bulkier and designed for withstanding the elements, which is fantastic, because when it is pouring outside I want my camera to work. Inside I am not concerned with the weather, what I do want is a nice, sleek and clean design. The Premier Collection offers indoor dome options that are perfect for high-end installations where the cameras should blend in seamlessly with the decor. Featuring housing options such as brilliant white or jet black these cameras will work with any interior design option. 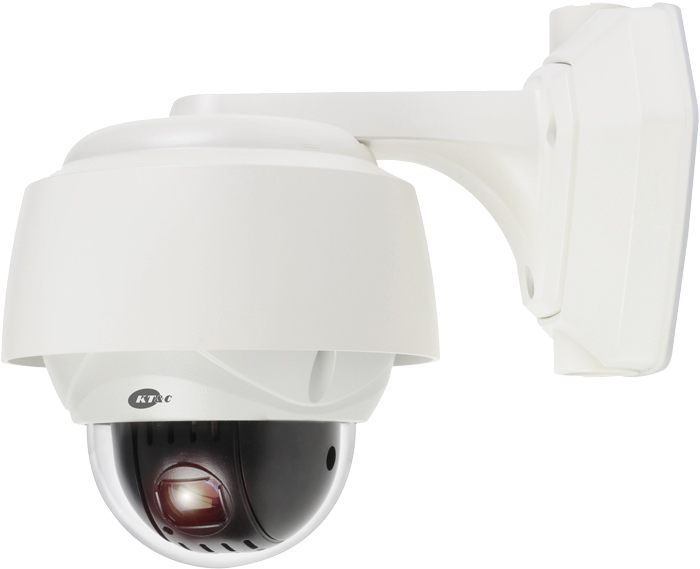 The flexible 2.8-12mm lens along with 3-Axis housing design allow these cameras to be mounted anywhere. The smart IR range and digital wide dynamic chipset allow for a clear image whether light is streaming in from the windows, or there is complete darkness. 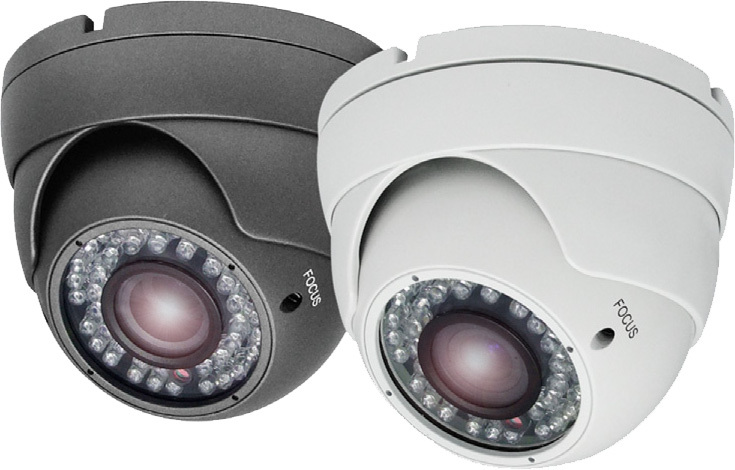 Even though the cameras have a premium design, that includes a 5-year warranty, their price is extremely affordable. While I certainly understand why people try and save money by buying kits that feature one camera for every application, I think there is a better way. 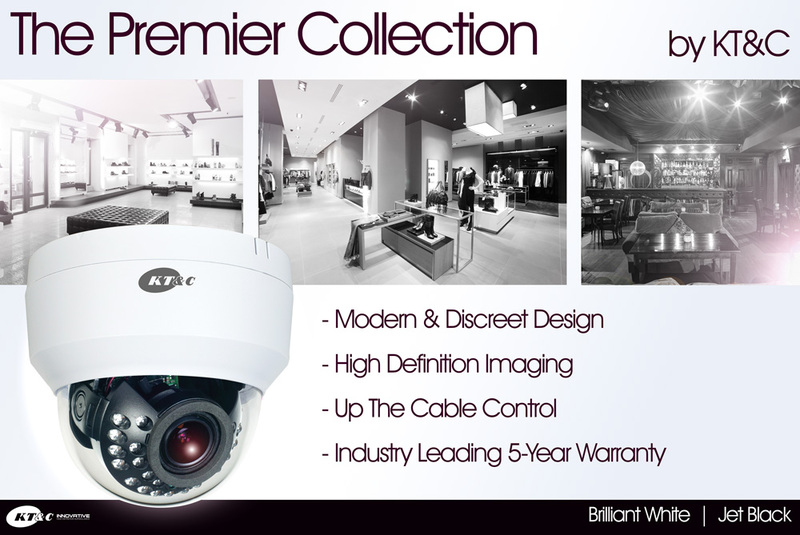 KT&C’s premium collection offers indoor cameras to use inside and outdoor cameras to use outside, all at a price that is econimical. And for applications where you need to be discreet we offer a whole line-up of miniature cameras that can be used anywhere.